Blood Feud in New York brings the fun and game play of great war games (such as Axis and Allies) to the mean streets of New York, where you and your opponents take on the role of mob bosses vying for control over the 5 Burroughs. The Blood Feud ignites quickly as you, the members of your crime family, and your hired guns defend turf and strike out at your opponents. The name of the game in Blood Feud is money - having the gang with the most dollars. You gain it by controlling territory and having illegal activities set up in your territory. Fighting over the turf and the gambling dens, brothels, fences etc. is how you claw yourself to the top and be crowed King of the New York Underworld. Blood Feud in New York was a lot of fun for the Rainy Day Games team. While it obviously offers some direct comparisons to Axis and Allies and some of our other favourite intermediate-level war games, this one takes it theme and creates some fantastic tactics and strategies which made Blood Feud a pleasure to play. The hundreds of well-made plastic miniature pieces will fight their Blood Feud on a board representing the 5 Burroughs of New York. The board is segmented into city districts, water districts, and airports. And during play, your will fill this board with buildings: corrupt police precincts, illicit activities and penthouse palaces from which you direct your criminal war. As the head of a New York crime family you have family members, employees, buildings, and transportation as the weapons at your disposal. In the first phase of your turn, you get to move and attack with your personnel. Each type (boss, family member, thug, henchman, hitman) has different movement and attack abilities, so as a good Mafia boss you want to carefully balance the make up of your force. Also, you can load your Mafia soldiers into speedboats, limousines, and helicopters to raid deeply into your opponents' territory. You resolve battles with dice rolls and as your men trade gunfire they will kill and be killed, but not before one last retaliatory shot. After you attack and move your pieces, you calculate your income for this term. You add up all your territory, illicit activities and penthouse palaces to come up with the amount of income your empire can create. Then, you multiply that income by the number of independently operating family members you have. The "made men" of your gang, they are the middle managers of your empire. As they spread out they can make more money. For example, if you have 3 family members huddled together for protection, you multiply your case income by 1. But if they spread out over 3 city districts, you multiply your base income by 3. Huddle together for protection? Yes, in a Blood Feud things can get ugly. If one of your family members is defeated in battle, the winning player can choose to kill him, ransom him to you, or hold him prisoner (maybe to later exchange him for one of his own?). And of course the Boss piece represents the heart of your organisation, and if he is killed you're out of the game and your assassin absorbs your assets. So protect him carefully! After you receive your income for the term, you can purchase things. You can never buy more family members, so they are precious. But the three kinds of employee, the three transportation modes, and the three building types are all up for sale (as long as some pieces remain in the bank). Blood Feud in New York makes these nine different choices hard, because you are always trying to attack and defend on multiple fronts. Choosing the right mix of building infrastructure, enough soldiers, and sufficient transportation to take on your enemies is one of the toughest parts of the game. The game is won when one crime boss builds an empire which creates an income of $6000 in a turn. Keep in mind the multiplying effect of family members and the fact that an assassinated boss turns over his family members to his killer... A crime family's earnings can jump rapidly after just one surgical attack on a rival boss. The most dynamic part of this game is the idea of penetrating enemy territory. More traditional war games tend to have a "front line" which is heavily defended, and a weak but safe interior which provides the economic strength to supply the military up front. Blood Feud in New York is different. Although there are a few ways to stop the advance of the enemies, for the most part limousines just glide past your personnel, who have no idea there are enemies lurking behind the smoked glass. Helicopters fly high overhead to drop off enemies at the rear of your territory. And of course speed boats just take the river right around to the soft side of your defence. Using and defending against these transportation tools is the key to this game, and can create a big challenge to a group of experienced players. Who should buy Blood Feud in New York? We loved playing Blood Feud in New York, and it will definitely be played in the future. But then we're a group of guys who get off on this stuff, so check to make sure you've got the group to appreciate this great game. Its rule book is lengthy, exhaustive, and will take you the better part of an hour to digest in you read it all through in a group. But there are lots of examples and points of possible confusion are repeatedly clarified (and then clarified again), so everyone gets to be really familiar with the rules. It is going to take you at least 4 hours for your first game (especially if you have 6 players), although we found things smoothed out and sped up as we got familiar with it. And, because the players each do an entire turn individually, there are times when a player can safely go get a smoke or make a Pizza Pop without missing a single thing. Having said that, this is most exciting thing to happen to Axis and Allies / Gamemaster fans in a long time. More so than the recent upgrades to the A&A line. Because instead of more of the same, Blood Feud in New York is fresh and new, but right on the money for complexity and just raw feel. If you can transfer your excitement about ordering a tank division assault to excitement about dropping a team of hitmen to take out a rival Mafia don, Blood Feud in New York will be a great buy for you. This is a hard action, take no prisoners game. You are a Boss at the head of a powerful criminal organization. You and your adversaries are currently based in one of the five boroughs of New York or in New Jersey. Your goal is to build and expand your underworld empire by any means necessary. This can include corrupting precincts to increase your take, kidnapping opposing family members for ransom, and the coup de grace, taking out the opposing families’ bosses, thereby removing them from the game. 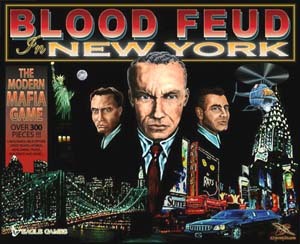 Blood Feud in New York is a 2-6 player game, for players ages 12 to Adult. Playing time is typically 3-4 hours. As with all Eagle Games, the attention to detail in Blood Feud is outstanding. The game includes over 300 highly detailed miniatures, buildings, hit men, gangsters, limousines, speedboats and helicopters (with rotors that spin!) The gameboard features an almost exact roadmap of New York and New Jersey.